I've been meaning to do a post on some goodies I got a few weeks ago but never really got round to doing it. I'm really thrilled to be talking about these products I've ordered online and picked up in store and hopefully you like it and pick up a few of the same items yourself. I'm not really one for makeup but a few weeks I decided to order some off of MUA's website, one of the best decisions I've ever made by far. I've been loving sparkly nail varnish for quite a while now and I was very much pleased with the results, I have to admit it can be quite messy and a little sticky but for the price it is a great buy. Lipstick is really starting to become popular with more people and I was a little scared to order myself one as I wasn't sure whether it would suit me or not but I really like it, I'm not sure whether I just wasn't putting enough lipstick on but it came out a little dry on my lips but I added some lip gloss to it and I really loved it. 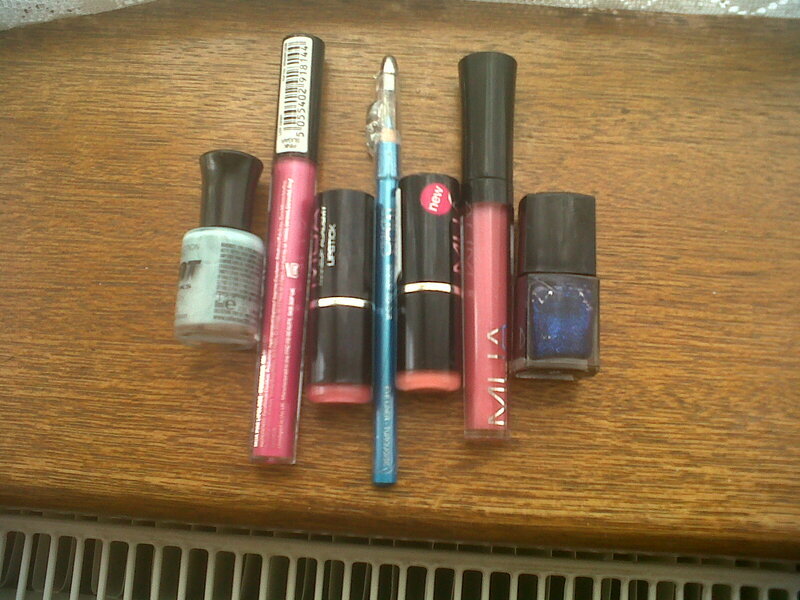 My final purchase was the £1 lip gloss in shade 5. It smells like sweets which I love and makes your lips look fuller. It's something that is just nice and easy to apply not a hassle to put in your bag and it's just generally something you can keep buying that won't disappoint you. 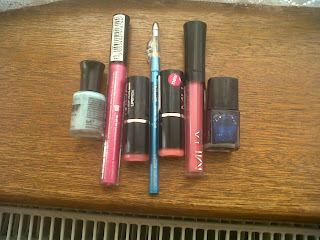 Yesterday I posted about how I'd going shopping and bought a few bits for my giveaway as well as general little things. The first I bought was a nail polish by Collection 2000 which I was super pleased with, I've trying to build up a collection of nail polishes and as soon as I saw this colour I knew I'd be buying it. It's sort of a pastel blue which is definitely great for spring/summer. I've been eyeing up a pastel blue blazer for £15 in Primark which I really want to get so when I do hopefully get it I know I'll be pairing it up with this nail polish. The second thing I bought was a lip plumping lip gloss which was actually a total accident, I was meant to pick up the £1 lip gloss because I already have the shade 5 one and when I got home tried it on it looked AMAZING.. But then a few seconds later it started to burn which I was a little afraid of until my friends told me about lip plumping lip glosses and how some make your lips tingle. Even though it looks great on I'll be thinking long and hard to when I'll be wearing it. I've never heard of lip plumping glosses so I feel like this is all new to me. I thirdly picked up another lipstick because I think MUA's lipsticks are just perfection. I really love the colour I picked up as I feel it really goes with my skin tone and gives it an edgy kind of look and I'm really excited to go out and show it off. 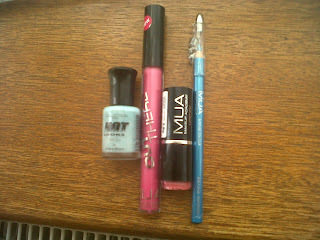 I finally bought a blue eyeliner that's been on my wishlist for quite a while now. 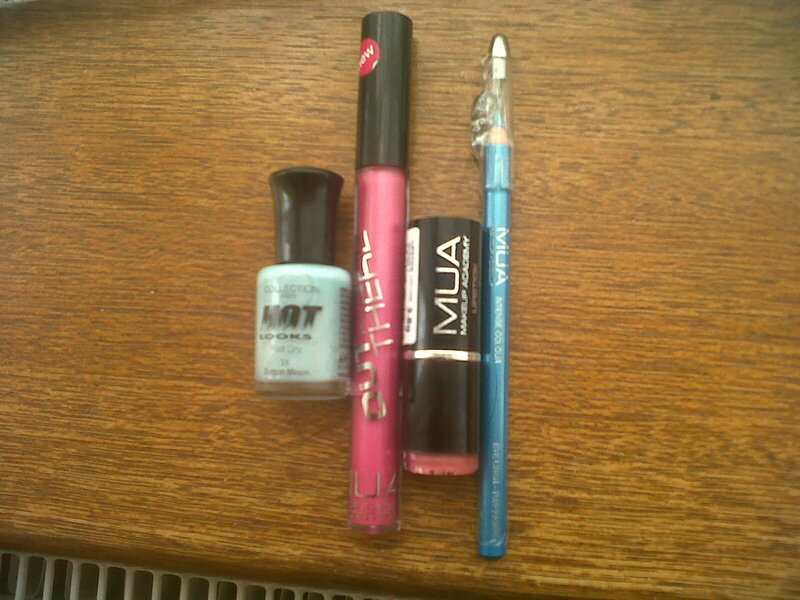 Last month I went to a party and my older sister did my makeup and used a really great blue eyeliner from Barry M.. I've read reviews on this one so I thought might as well as It is much cheaper than the Barry M one. I'll definitely try it out and compare both of the products. All in all I'm pretty happy with everything I've got. I can't wait for another event where I'll be able to give some of these a go. I'll post pictures whenever that is. Have a good one, Vanese. 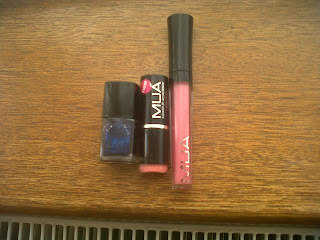 ooh glad you did this post - never tried the lipsticks from MUA but they're definitely next on my wishlist now though..